Growing up, my parents didn’t allow us to have inside pets. We had plenty of animals, but because we lived on a farm, they all roomed and boarded outside. Except for an occasional newborn calf or litter of pigs that had to be brought in to warm by the oven or in front of the fireplace, when the temperatures had dropped well below freezing or there was several inches of snow on the ground, our ‘pets’, whatever they were, stayed outdoors! However, when I had children of my own, and lived in town, I still wanted to give my kids the opportunity to know the mutual love and affection of having a pet, so eventually we ended up with our first inside cat. This cat was soft gray in color, with the most beautiful emerald green eyes I have ever seen, and a distinctive personality to boot. She came to us as a kitten, soft, cuddly, and adorable, and quickly became queen of the household! She was well-cared for, and well-loved, and came, went, and slept as she pleased. Because she originated from an outdoor cat parent, she still chose to be outside, sometimes more often than she was inside, and would wake me in the middle of the night to be let out. But she was always at the back door first thing in the morning to be let in to eat, and she soon found the warmest spot in the house to snuggle in for her day-long cat naps! We never knew where she might be curled up! After a time, and she was now a grown up, we adopted puppy-Maddie. Even though the puppy was 4 times her size, the cat still considered herself the ‘mother’, and would watch out for the puppy as any responsible parent would! As was intended, the puppy lived outdoors, but nevertheless, the cat and the dog remained lifelong friends, and I would often see the cat outside near Maddie’s pen, napping, or just keeping an eye on her “pup”. Although she was most certainly her own entity, she graciously brought me presents, came when I called, didn’t mind kids and their attempts at petting her, lived with us, let us take care of her, and in her unselfish way, kindly gave us the impression that we were actually in charge. This cat was unique in many qualities, however, the most comical practice she had was to follow Maddie and me on our walks. No matter how far or which direction we went, if she was outside, she followed us all the way and back. I was certain that she was still exercising her ‘parental’ expectations toward the dog, until one day when my car was in the shop, I set out to walk to work, and lo and behold, I looked back (because I heard rr-row-ing), and the cat was following ME! I realized then that it was not only the dog she was watching out for, but me too. She continued to be attentive to her chosen ones and allowed us to be part of her life for almost two decades. We lost her three Januarys ago. After being with us for over 15 years, we’ve truly felt her loss. A beautiful cat with a beautiful soul, she valued her independence, always took care of herself, asked no special help or considerations, and her humans respected her choices. She loved us unconditionally, as we loved her in return. I still miss her — her characteristic purr, her unusual habits, her particular meow, and her kitty antics, but mostly, I miss her presence. 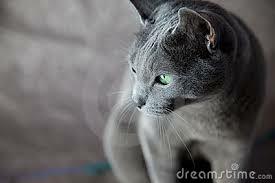 Her passing has left a big hole where a soft gray being with a sweet spirit and beautiful green eyes should be.